This gorgeous little piggy takes the first-place ribbon for the greatest baby favour of all time. Here’s a gorgeous little guy you can “bank” on to dress up your decor and put on a smile on your guests faces. 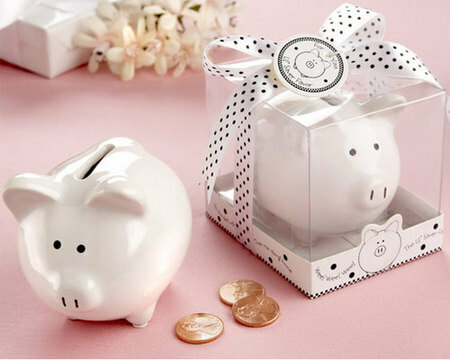 The white, ceramic pig has an endearing little face, a large slot on his back for spare change and loves money! Perfect favours for Baby Showers, Christenings, 1st Birthdays and much more! Presented in a clear gift box with a white, satin ribbon and bow with black polka dots and a matching “For You” tag with a gorgeous piggy image.